For the last few months I’ve been making positive changes in my everyday work routine. I work as a web designer and it requires sitting in front of the laptop for at least 6-7 hours a day. The body will become better at whatever you do, or don’t do. If you don’t move, your body will make you better at not moving. If you move, your body will allow more movement! I believe that continuous sitting is the worst thing for your body, and not even “gym after work” or “morning jog” is going to eliminate negative consequences. I knew that I had to do something instead of just saying “I have to sit because of my job”! I’ve been already using laptop for many years, with external screen, keyboard and mouse. For it’s simplicity and flexibility. The next step was to get rid of the external screen and not be depending on my “working desk”. Working as web designer (usually from my living room) on 14’ laptop was a bit challenging on the begging but it’s just matter of habit. The whole 2016 year I was travelling quite a lot and it was perfect opportunity to test my “mobile” working routine. I’ve felt more free than any other time before. It wasn’t intentional but somehow I started to spend more working time outside of my already minimal working desk (laptop + mouse). Then I asked myself, what’s the reason to have office desk and chair if I don’t use them? I got rid of them as well. I’m sure a regular office worker would ask me “how and where the hell you work now?!”. I work wherever I want. 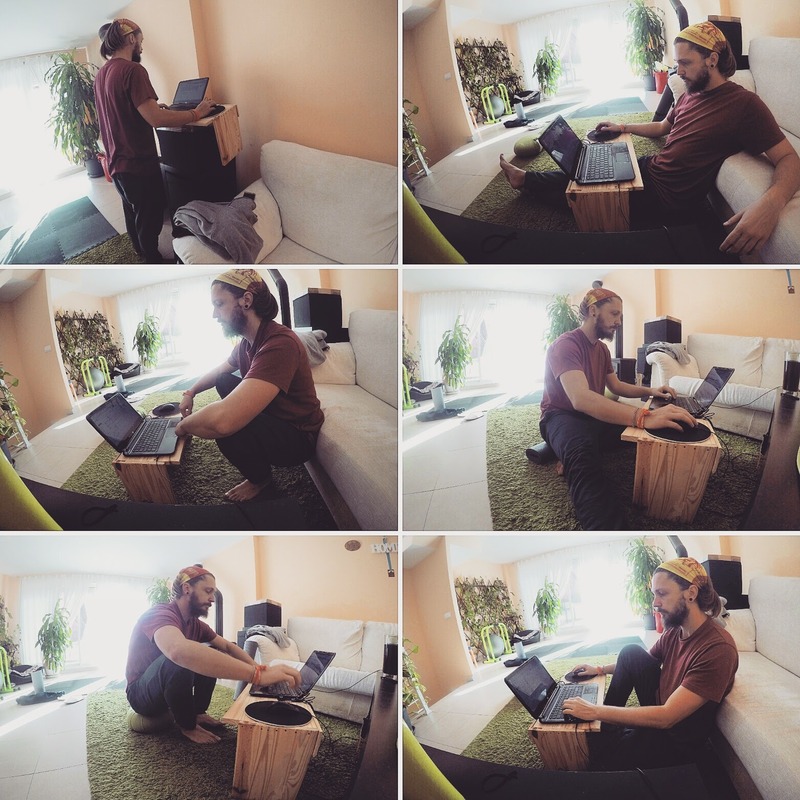 I still use my living room the most of the time, but instead of passive sitting 7+ hours a day on the chair I use different positions and places. I built a small wooden table that is perfect for deep squatting, kneeling, sitting on the floor, crossed legged sitting, standing (you put it on a furniture), the possibilities are endless. I’m aware that not everybody would be able to work like this and not everybody would consider this as effective for working, but for me is the best working environment ever. I recently even temporary got rid of a carpet in living room and replaced it with puzzle tatami, so I’m actually all my working hours on surface that allows me to move each one second I decide. I don’t need to go to gym, change my clothes, start tracking. I just move! Sitting on chair is comfortable. But comfortable doesn’t mean healthy or good. I could sit on chair without moving for hours. That’s the worst part, you don’t realize how bad it is because you don’t feel it immediately. It’s long term process. However if you don’t have a chair and using all the previously mentioned positions, you cannot stay in the same position (kneeling, deep squat, …) for hours. Your body tells you after certain time “enough, change the position, move”. And this is what I love about not having chair or table. I could stay in kneeling position for maybe 20 minutes, and then I need to change it to sitting cross-legged, or deep squat. I still do my long “moving sessions”, even HIIT from time to time (combined with more natural movements), but what makes the biggest difference for me are these small everyday micro moves. Maybe it’s hard to imagine what does it mean to move for me. I will write an article about that later, but for now the easiest is to check my Mvmnt board here. I’m sure you will get an idea what I’m talking about. Simply put, I move to feel better inside and with my body. To have better connection and better understanding of what’s going on. I don’t have any specific goals like gain muscles, run faster, lift more weights or to do back flip ( that would be cool however :D ). I just want to be able to live now and in the future without pain, health issues, prevent injuries and use of my body’s ability the most I can. At the time of writing this article I’m sitting in train. Yes sitting. I know that many people cannot do all the changes I made. And that many of you don’t have all the possibilities I have. But before you tell yourself “it’s not for me, I just cannot do that”, try to think about the smallest possible change you can make. Maybe to stand up each half an hour, do squat, push-up, jump, touch your toes. It requires literary seconds and almost no space at all. I set an alarm on my laptop to display each 20 minutes a message “Stand up RIGHT NOW and MOVE!”, in case I got comfortable in current position or simply forget because I’m too focused on work.